For the Yamim Nora’im, Ezer Mizion has set out on a major fundraising drive to raise the money needed to finance scanning tens of thousands of stem cell samples, so as to expand its International Bone Marrow Donor Registry. Rabbi Chananya Chollak, the organization’s International Chairman, took the time to speak with us personally about the need for public support to fund lifesaving activities, to tell us about Ezer Mizion’s goals, and to convey a message to the public. Ezer Mizion, winner of the distinguished Israel prize in 2008, was founded about thirty years ago to ease the anguish of the ill and disabled in Israel. With a staff of professional workers and more than 25,000 dedicated volunteers, Ezer Mizion today operates from 57 branches, deployed in 30 cities across the country. Assorted paramedical services are provided to some 670,000 people in Israel every year, at no fee, and without regard to race, religion, gender, nationality or political affiliation. In 1998, with the help of Dr. Bracha Zisser and her late husband Moti z”l, Ezer Mizion established its International Bone Marrow Donor Registry, to help cancer patients and people with other diseases find a matching stem cell donor and recover from their illness. Over the years, more than 860,000 members have joined the Registry. Thanks to them, so far the lives of 2,569 patients in Israel and around the world have been saved. Since 2005, IDF soldiers have been joining the Ezer Mizion Registry as part of their induction into the army. Now, Ezer Mizion is calling on the public to join the effort and help fund lab testing for 40,000 recruits when they join the army. The cost of scanning each bone marrow sample is $50, which must be funded by Ezer Mizion via private donations. According to the organization’s statistics, about 10% of all cancer patients will need a stem cell transplant at some stage of their illness. 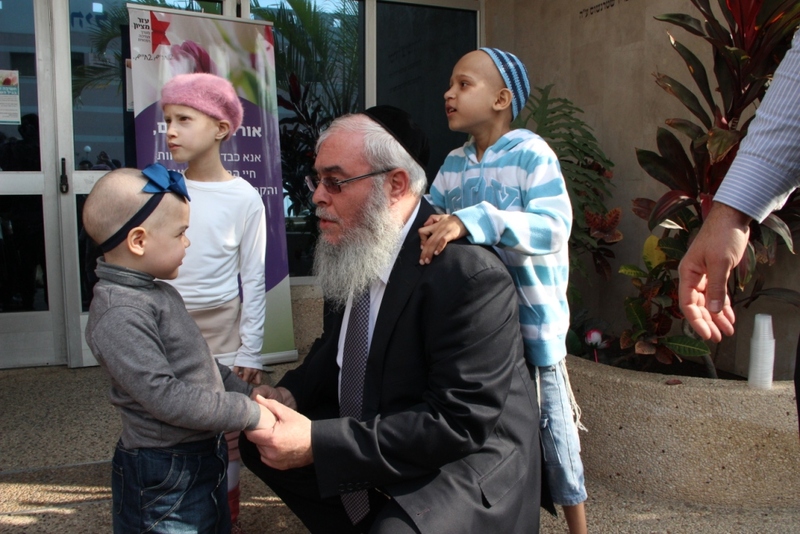 “Without the Bone Marrow Registry, many patients wouldn’t survive,” says Rabbi Chollak. “Every month, we are privileged to save 30-35 people in Israel and around the world. The public’s partnership helps us to continue saving lives. “Ezer Mizion’s support services emerged from the field. In our work at hospitals and in the community, we learned what the needs are and we have done whatever possible to provide solutions for the ill, disabled, and elderly. We created a system of services, an all-embracing support package,” explains Rabbi Chollak, “and this helps patients and their families meet their challenges and ‘choose life.’ The package that we provide envelops the patients from every direction; it doesn’t give one specific solution or another. And it also gives them the encouragement they need to get through this difficult period without breaking down. “Every day, I encounter heartrending stories about children coping with their parent’s illness or parents dealing with their child’s illness. We are committed to help them get through this tough time. The “serious illness obstacle course” forces many parents to leave their jobs, stop their routine, put their lives on hold. The home often falls apart. We said to ourselves: “Let’s create an overall cushion for patients and their families.” And so, we established a system of services that includes medical counseling, ambulance transport, loan of medical and rehab equipment, hot meals, a network of volunteers, mentors, and coaches, and more. All of these things cost a lot of money.